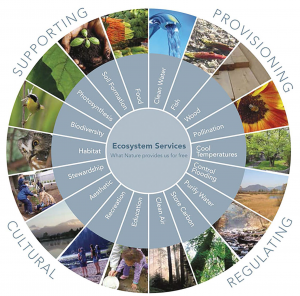 Ecosystem services are the benefits people obtain from the ecosystem (MEA 2005). 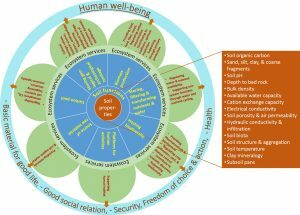 A conceptual diagram was developed by Adhikari and Hartemink (2016), which relates individual soil properties to soil ecosystem services. Soils variety also allows a diversity of soil ecosystem services, which benefit not only humans but also soil biota and the surrounding environment. In a mountainous environment, some services are in comparison to lowland areas of particular importance such erosion control or flood protection. Since soil ecosystem services are based on Soil Functions and Soil Biodiversity, this section also holds further information on those topics. 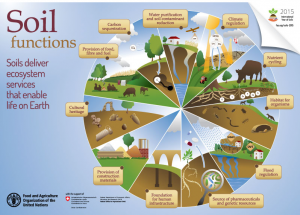 The provision of soil ecosystem services relies on soil properties, processes and functions. Furthermore, healthy and diverse soils ensure biodiversity among soil biota (soil biodiversity), which in turn guarantees the provision of soil ecosystem services. 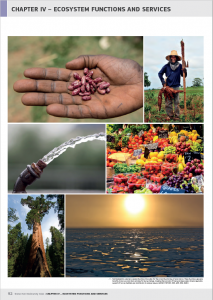 You can read more about ecosystem functions and services in a summary, written by Dr Edmundo Barrios (UN Food & Agriculture Organization).